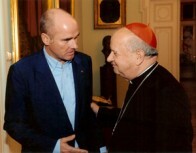 Cardinal Stanislaw Dziwisz, Archbishop of Krakow in Poland, for 39 years the closest advisor to late Pope Johannes Paul II, met Dr. Hubertus Hoffmann, President of the World Security Network Foundation, discussing The Human Codes of Tolerance and Respect Project. No man was closer to Pope John Paul II than Stanislaw Dziwisz, now the Cardinal of the Cultural Center of Poland in the South Eastern university city of Krakow. He met then bishop and later cardinal Karol Wojtyla in Krakow in 1966 and became his secretary and later, as Archbishop, the right hand of the newly elected Pope until his death in April 2005 for 39 years. The same year he followed his friend and spiritual master and took over his former position as Archbishop of Krakow. "John Paul II lived in God. He was looking for thoughts and God in daily life, made people happier and talked to everybody by addressing the young people. It was not so much his great personality but his living-in-God that made him strong and influential", Dziwisz told a meeting of YPO members organized by European Chairman Przemyslaw Aleksander Schmidt, who is also a member of the WSN International Advisory Board for Poland. As a defender of human rights he was a rock standing against inhuman communism in Poland. This power of high moral authority was seen as a threat by the KGB, who tried to eliminate him in a failed shooting attempt on Saint Peter’s Square by a Bulgarian professional killer. Asked by WSN about his position on the dialogue with Islam the cardinal reminded of the meeting by John Paul II with Islamic elders in Damascus who welcomed him as 'our Grand Mufti'. The future depends very much on the ability of a constructive dialogue with Islam and to find values we can share. Struggle is not the right way but to look for common roots. Introduced to the WSN project The Human Codes of Tolerance and Respect (for details see www.codesoftolerance.com ) the cardinal welcomed this approach and praised "my good friend Alfons Nossol", the Archbishop in Opole-Oppeln in Upper Silesia in Poland, whose experience as the great reconciliator between the German and Polish people and fundamental thoughts on the Christian way of peacemaking have been integrated into the code’s wordings and proposals ( see Alfons Nossol: Christian Peace Policy: Combating Ideology and Nationalism with a "Thoughtful Heart and a Loving Mind"; Dr. Hubertus Hoffmann: The West needs Holistic Formulas for Peace on the basis of Diplomacy plus Power plus Reconciliation; Dr. Hubertus Hoffmann: The Christian Message of Peace, Reconciliation and Tolerance). "Here in Poland you may find many values we can share with others", the cardinal added. Another Polish icon of global effect with whom I had the honor to have dinner was Lech Walesa, founder of the Solidarnosc movement and leader of the Gdansk shipbuilding strike which started in 1980. The man who impeached Communism in Poland and helped defeat the Soviet Union in the 1980’s was awarded the Nobel Peace Prize in 1983, and became the first post-Communist President of Poland in 1989. A simple man from the streets, a worker, not an intellectual, a general, or a politician, Walesa is just a down-to-earth man with courage and guts founded in a faith in God (which he symbolizes by wearing his famous Maria button, a gift of Pope John Paul II). Now he looks much fitter, happier and more full of wisdom than when I met him some years ago. "The Russians were the victims of Communism themselves and are the winners – not the losers – of the wind of change, as Gorbachev and Yeltsin were aware but not Putin and many of his followers now", this icon of freedom and a united Europe argued.